Red/Blue Hammock w/Stand Carry bag. Hammock Frame is designed to accomodate a double hammock (included). This lightweight frame can be easily assembled without tools. All components are powder coated steel. Hammock frame + double hammock. Overall Size : 250cm x 111cm x 110cm(98.42″ x 43.7″ x 43.3). Base Dimensions: 111cm (wide) x 104cm(space between legs). Includes: 1 dbl hammock + 1 stand. Desert Moon Hammock w/Stand Carry bag. 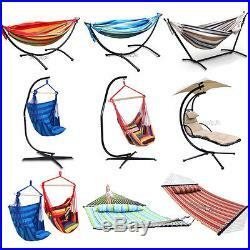 Best Choice Products presents you this brand new double hammock with steel stand. This hammock is designed for promoting relaxation lifestyle in any outdoor place. This hammock is able to accommodate two adults, up to 200 kgs, you will love sharing this hammock on a warm summer day. With the included carrying case, you can relax at any outdoor place. Hammock made of 100% cotton. Stand constructed of sturdy & all weather-resin steel. Accommodate 2 adults, up to 200kgs. Carrying case is included. Overall Dimension: 275cm(L)100cm(W)110cm(H). Product Weight: 13.5kgs. Weight Capacity(lbs): 200kg. Rainbow/Blue Hanging Chair w/Seat. This Popular Chair Hangs Anywhere. Cotton & Polyester Construction. Weight Capacity 265 lbs. Measures 38-3/8″ x 15-1/8″. Beige Hanging Chair w/Canopy. Best Choice Products presents you this brand new dream hammock chair. The modern design fits with any backyard décor. It is also a great piece that allows you to sit back and enjoy the breeze in your backyard. Modern design heavy duty powder coated metal frame , support up to 150kgs. Perfect piece with any backyard decor. Include 2 foam filled PVC coated polyester cushion with built-in pillow for extra comfort. All weather-resist 100cm build-in canopy will protect you from the hot sun. Umbrella can be left off for indoor use. Simply assembly with all necessary parts included. Product weight: 38.5kgs. Rainbow/Blue Hanging Chair+C Stand. This Is C Frame Hammock Chair Stand, Which Is Ideal For You To Enjoy Your Hammock Chairs Indoor Or Outdoor. It Is Of A C Frame Style Proving You 360 Degrees Of Hanging Freedom. It Is Perfect For Your Patio, Deck Or Yard In Style. Brand New And High Quality. Ideal For All Indoor And Outdoor Surface. Works With Most Air Chairs. Black Powder Coated Rust Resistant Finish. X Base Takes Up Little Space But Provides Great Balance. Easy And Quick Assembly (Tools Included). Open Size :79(L)x112(W)x205(H)CM. Material: Cotton & Polyester Construction. The hanging rope chair is a fashionable and comfortable kit to any family! Offering great comfort with affordable price, it is a fantastic way to enjoy your spare time! The chair is made of cotton and polyester construction. It’s made to be used inside or out in any climate. This great chair also includes two comfortable pillows. Hangs easily from a single point, you can enjoy the hanging rope chair anywhere! Designed for indoor and outdoor use. Easy to hang and assembly. Lightweight and firm, with 2 pillows make you more comfortable. Suitable for outdoor use, perfect for backyard, camping, hunting, hiking, traveling, etc. Perfect to hang on porch or branch. 1 x Hammock C stand with installed tools. 1 x Canvas hammock hanging chair. Red/Blue Double Hammock w/Pillow. We are proud to present our brand new quilted pillow hammock. These hammocks feature a quilted fabric that is dye treated for UV resistance, solid wood spreader bar, and a design that is sure to accentuate your backyard with tasteful color combinations. These are high quality hammocks that will last for years. 135″ X 55″ overall length (75″ X 55″ bed length). Pillow is detachable (buttons). 1.5 thick hardwood spreader bar. Weight capacity is 450lbs. It comes with 12 chains for easy setup. Please note that the stand is not included, hooks is not including. The item “Multi Double Hammock/Hanging Hammock Swing Chair/ With Seat/PillowithCanopy/Stand” is in sale since Monday, July 06, 2015. This item is in the category “Home & Garden\Yard, Garden & Outdoor Living\Patio & Garden Furniture\Chairs”. The seller is “greatshoppingday2012″ and is located in Rancho Cucamonga, California. This item can be shipped to United States.